Welcome to the Mercer University Press Marketing Department. Like many authors, you may have questions and ideas about the promotion and sales of your upcoming book. We look forward to working with you through the marketing process and utilizing your specialized knowledge about the audience for your book. The following information will give you an overview of the marketing activities that will be used for your book. The Mercer University Press marketing department is responsible for the promotion and sale of approximately 40 new books each year. In addition, we maintain an extensive backlist of titles. To promote our books, we use the same efforts as commercial publishers: production of seasonal catalogs for bookstore, library, and individual customers; advertising in journals and publications; direct mail to organizations, bookstores, libraries, faculty, and individual book buyers; exhibits at academic, library, and bookseller conventions and trade shows; publicity (including press releases, advance copies, review copies, booksignings, and interviews); award submissions; and website marketing and sales. Unlike commercial publishers, we endeavor to keep your book in print as long as sales continue. 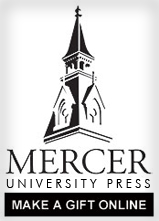 Once you have signed a contract with Mercer University Press, we ask that you complete our Author Information Form (AIF). Complete this form as thoroughly as possible and email it to mupressorders@mercer.edu. Although not all questions will be appropriate for your book, you should pay particular attention to the brief biographical sketch (50-75 words), the précis of your work (50 words), and the 300-word book description. This information is utilized as the basis for catalog and jacket copy for your book. When preparing your description, please bear in mind that many purchasing decisions for libraries and bookstores are made by individuals who are not specialists in your field. The AIF is also consulted extensively as we plan the marketing strategy for your book. When your book arrives from the printer, you will receive complimentary author copies (as per your contract). We will also begin shipping books to libraries, bookstores, and individuals who have placed pre-publication orders. Review copies are sent to newspapers, journals, and magazines. The list of reviewers is compiled from reviewer requests, your suggestions, and our own in-house review list. And although we do try to consider all requests, there are limits to the number of copies we can provide. The direct mail program consists of seasonal catalogs, series flyers, subject brochures, and targeted mailings for individual books. These mailings can be very effective, so please consider any professional organizations or subject area lists you may be able to provide. Advertisements for your book will be scheduled to appear after the book is in print. The advertising plan will take your suggestions into consideration as well as the constraints of our promotional budget. We often are able to optimize our advertising dollars by preparing ads that include related titles. Photocopies of any ads, direct mail pieces, or reviews for your book will be mailed to you on a quarterly basis. We will exhibit your book at the many academic conferences, library meetings, and bookseller conventions and trade shows we attend. In addition, if you will be attending a conference and would like your book displayed, please contact us so the necessary arrangements may be made. We will also work with you to coordinate book signings and speaking engagements. Your participation in the promotion of your book is invaluable. Therefore, an Author Kit will be prepared for your book and will include a supply of flyers, press releases, bookmarks, and other marketing materials for your use as opportunities arise. In addition, we will include a separate page for your book on our website www.mupress.org and encourage you to add the URL to your outgoing email signature. Marketing your book requires a coordinated effort between author and publisher. Our goal is to make your book and experience with us a success. By working together and coordinating our marketing expertise with your specialized knowledge, we will reach our goal.